A trip to Thailand is hardly complete without sampling every inch of the country’s dynamic cuisine. You could easily plan your entire holiday tasting your way through the specialities of each region. What’s more is the range of your options. In many countries, if you’re not a fan of spicy food or another definitive flavour, you may be a bit out of luck. The Thais offer something for absolutely every palate, however – a savory massaman curry (rich peanutty curry with chicken or beef), salty luk chin ping (meatballs), tangy si khrong mu thot (deep fried pork ribs), sweet mi krop (crispy fried noodles), hearty khao man gai (chicken and rice), or a wholesome kaeng liang pak ruam (vegetable soup Thai style). Of course, if you’re a maniac for food as spicy as you can tolerate, well, they’ve certainly got that too. The only drawback is that your cravings won’t subside once returning home. Especially given the typical high price tags for Thai food around the world, you’ll be dreaming of the days snacking on $1 Pad Thai. That is unless you learn how to make it yourself. Since food is such an important part of the culture, every visitor should try out a cooking class at least once. There’s no better place than Bangkok itself, the epicentre of food and culture for the country. Cooking classes are offered city-wide from the most basic to extremely upscale, and everything between. Classes will typically begin with a visit to the market – an incredibly valuable step so that you can identify everything that will be in your food! Of course, come on an empty stomach. Following the cooking course itself, you get to indulge in all of your spoils. Situated along Bangkok’s labyrinth of canals, the Chef Leez Thai Cooking Class meets in a state-of-the-art air-conditioned classroom boasting 90 square meters of space. A homey atmosphere with low-pressure teaching style, Chef Leez offers a class truly open to any level of cooking expertise. Consistently rated at number one on sites like TripAdvisor, the class is known for the Chef’s bubbly presence and personalised attention to each of her students, along with her quippy cultural anecdotes to accompany the cooking. It also offers small class sizes, flexible scheduling options and caters to vegetarians, vegans and various food allergies. As a bonus, Chef Leez issues a free recipe e-book with every registration. The Group Class is held from 10:00 – 14:00 every day, beginning with an introduction to the ingredients. Chef Leez guides the class through 12 set dishes, including Pad Thai, Green Curry Chicken and Sticky Rice Mango. So come hungry! You’ll be snacking throughout the entire session. Although the menu is set daily, the Chef saves time for in-class student requests. Small parties also have the option to book semi-private or private lessons from 15:00 – 18:00. For these classes, the group has the option to select five dishes from the Chef’s cache of online recipes. from 2,000 THB ($71), subject to a 5% tax. You want to learn as wide of a variety as possible. This class offers the best per-dish value by far. Chef Leez teaches you 12 dishes in the span of a class time where you may learn 3 – 5 dishes elsewhere. If you have a specific dish you absolutely must learn how to make, Chef Leez does her absolute best to accommodate during the reserved time for in-class requests. A holistic culinary experience starting straight at the source, Sompong Thai Cooking School begins its classes with a local market tour. Heralded for its stellar customer service and constantly changing the daily menu, the family-run program sends you home with a free cookbook and canvas tote. Each class begins with a short walk to the local market, where the teacher will introduce the group to Thai herbs, vegetables, fruits, coconut milk and of course, the chillies. Learn about the dishes you’ll be cooking alongside relevant Thai culinary history. The classes are conducted proficiently and are well organised, featuring one main instructor with several assistants to help students throughout the session. There are two time slots available every day, 09:30 – 13:30 or 14:30 – 18:30. Each day features a different menu, from options like stir fried chicken with cashew nut (Monday), spicy prawns with lemongrass salad (Thursday) and Panaeng chicken curry (Wednesday). You’re a history buff interested in the narratives behind the food. Sompong is also known for its attention to detail and organised service. Located in Bangkok’s largest slum of Klong Toey, Chef Poo – short for “Chompoo”, meaning rose apple in Burmese – comes from extremely humble beginnings. Her cooking school was founded five years ago with the help of many friends, and today is a booming business with a vibrant staff. The classes self-identify as a “real grassroots experience” where guests immerse themselves in Thai cuisine within the life of the Klong Toey community. Her school not only demonstrates an incredible success story from one of Bangkok’s poorest area but continues to provide economic and training opportunities for local residents. Classes begin at 08:30 with a trip to the Kong Toey wet market. After some explanation about the local Thai produce, the cooking begins back at the small school. Chef Poo aims to run every class personally (unless sick or otherwise unavailable,) with her expertly trained team of local residents. The menu rotates by the day and features five items. 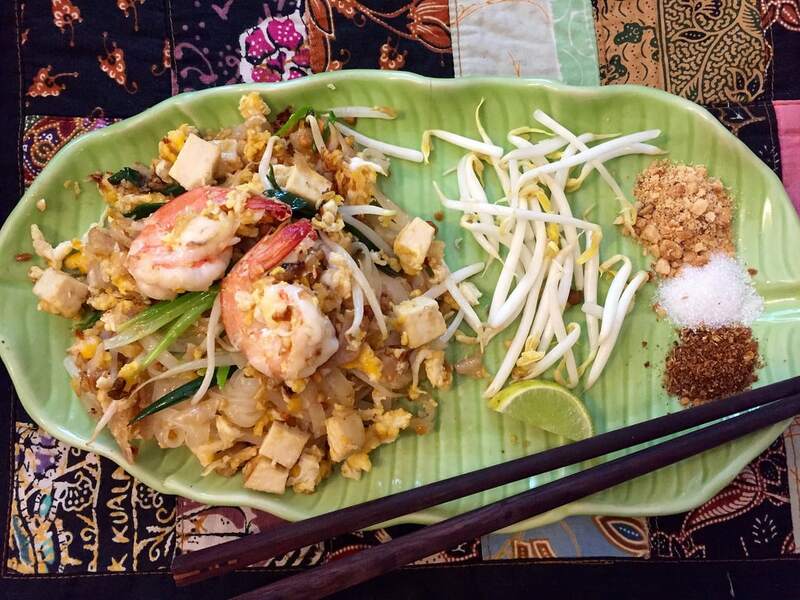 Favourites include tom yum goong (hot and spicy soup with prawns), yum nuea (spicy beef salad), gai ga teum (stir-fried chicken with garlic), and of course, Pad Thai. You want to meet a (local) celebrity! Chef Poo aims to be at every class, though her presence and personality radiate through her entire staff. The school provides a very excellent insight into local life in Bangkok, particularly in its most famous slum. Located in Bangkok’s suburbs in a quaint Thai-style home, BaiPai’s open-air setup is a little oasis within Bangkok. Students each have their own workstation among the garden that grows some of the fresh ingredients and produce used in your dishes. The staff are known to be warm and extremely laid-back. The school accommodates food allergies, vegetarians and vegans on request. BaiPai also includes a free shuttle service from wherever you’re staying in Bangkok and the return at the end of your class. The half-day classes are offered in the morning (recommended, as it gets hot later in the day) as well as the afternoon. Private classes are also available, and the school will also host larger groups or organisations. The school also offers a trip to JJ’s local market, but note that this is not included in all classes. If you want to visit the market, make sure to book a course including this trip. Students are taught four dishes per place, which rotate throughout their calendar. Some classes begin with a local market trip to collect ingredients, and in these cases three dishes are made during the session. Popular dishes include red curry pork with bamboo shallots, Thai style fried rice noodles and stir-fried pork with basil leaves. You want a quieter, quaint school with free transport included. BaiPai is also particularly accommodating for those with dietary preferences. Housed within the iconic Thai Chine Building, Blue Elephant Cooking School is longstanding and as chic as its internationally chic titular restaurant. The building itself is reason enough to visit; it boasts a storied history within its colonial-era walls. Blue Elephant is known as one of the best Thai restaurants in Bangkok, so it stands to reason that your dishes will be superb. Instead of the typical eat-as-you-go format of many schools, the students are served their own creations in the dining room following class. The school even sends you home with a complimentary apron and stash of cooking paste. Private classes and corporate classes are also available on request. For amateur and professional chefs, there is the Ancient Thai Cuisine Cooking Course as well. The course presents chefs with the training to cook ten of Thailand’s most historical dishes, including ma auan, kaeng mumba and lon taujiew poo. Students are gifted a certificate and a cooking set as a souvenir. Classes run both morning and afternoon with an orientation to Thai culinary philosophy. 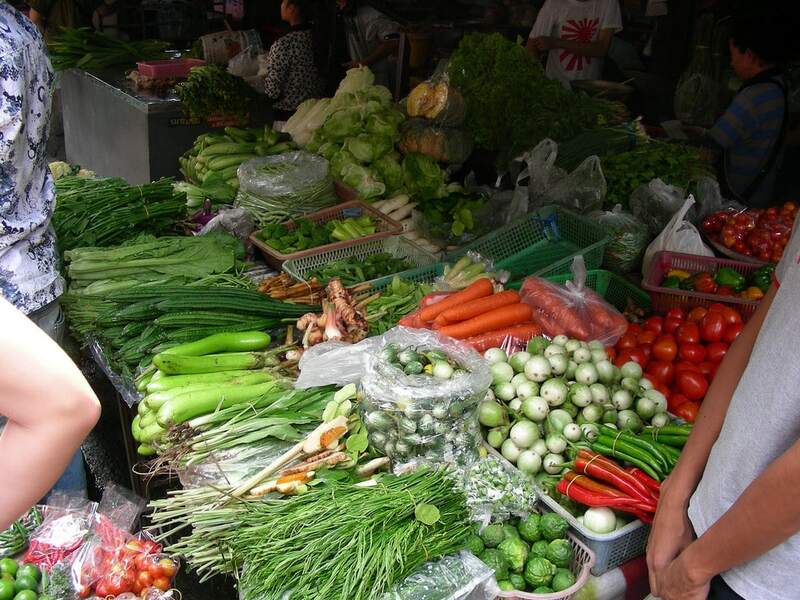 Those who attend the morning class will go to Bang Rak morning market, while the afternoon class features a demonstration of decorative fruit and vegetable carving. Sessions are organised to encourage interactivity as the chefs share histories of dishes and cuisine. Each student has his or her own workspace with modern equipment. The morning class runs from 08:45 – 13:00 and the afternoon class is from 13:30 – 16:30. 2,800 THB ($80) for morning class; 2,500 THB ($71) for afternoon class. There are also many packages available for several day class schedules. You want to participate in the history that is the Blue Elephant franchise, and take advantage of the most modern workspaces. Blue Elephant is also known for its great deals for longer-term students booking several-day courses. A Bangkok-based nonprofit, Courageous Kitchen began as Search of Sanuk, which provided food and housing to at-risk families. Following a few years of operation, a small group of students founded Courageous Kitchen. The program now aims to provide specialised skills and employment opportunities for families, encourage healthy eating habits and offer a safe space for children to learn, develop and have fun. The kitchen also provides pre-schooling for 3-6-year-olds, cooking and English classes for high school level children, distribution of food and support for housing to the local community, completely free of charge. Its half-day market tour and cooking class begin in the neighbourhood the kitchen supports, with a visit to the market. Class sizes are very small, with one to six participants, and classes learn up to three recipes. Some menu items include Pad Thai, krapow Thai basil and tom kha coconut soup. The class runs from 09:00 – 12:30 and includes transportation from the BTS Skytrain. You want to participate in a grassroots non-profit benefiting the local community. Proceeds to the school go directly back into its maintenance and benefit the free programs like vocational training to the locals. Fancy a bit of decadence while you cook? This Thai Cookery at the Mandarin Oriental is run in the hotel’s old wing, renowned for its signature service and opulence. The school is highly accommodating to guest’s requests and preferences, and a boat shuttle is available for transport. There are two types of class available, one inclusive of a morning fresh market trip. Private classes with Chef Narain are also available, with the option to develop your own menu, and group discounts are available. The class begins with a tour of the local market or garden grounds with an introduction to local herbs and vegetables. The chef demonstrates recipes, which the class then tastes before attempting the dishes themselves. Some dishes include dumplings with crab meat filling, spicy spare rib soup and fried tofu with pork and vegetable sauce. Everyone is then served their respective dishes with the chef during lunch at Sala Rim Naam. The class including the fresh market trip is offered on Saturday and Sunday only from 09:00 – 14:00. Monday – Friday the class is offered at a discount from 09:00 – 13:00. You want a fine dining experience in one of Bangkok’s best Thai restaurants. While tastings are available throughout the class from the chef’s own demonstrations, the class culminates with a meal in the Mandarin Oriental’s famed Sala Rim Naam. Regarded as one of the premier cooking schools of Bangkok, Silom Thai Cooking School consistently exceeds expectations. While open to all levels, the school accommodates amateur chefs with more experience as well, modifying and personalising classes around the students themselves. Instructors are all certified Thai cooks with a rich wealth of knowledge about cuisine and ingredients. Courses conducted in both the morning and afternoon include a trip to the local market. The school’s approach aims to engage students in an understanding of the raw ingredients, from purchasing to preparation to, of course, consumption. The school also accommodates vegetarians and vegans on request. Each class (excluding the night session) begins with a local market trip to buy the day’s fresh ingredients. The guide will introduce students to the varying tastes and histories of Thai cuisine and even are known to throw in a little introduction to Thai-style bargaining during the trips. There is a heavy emphasis on Thai cuisine as a way of life, how the locals approach cooking as a part of their daily routine. Back in the kitchens students create a five-course meal from scratch using traditional utensils and age-old techniques, including curry paste and coconut milk. Popular dishes include laab gai (minced chicken salad), sweet and sour stir-fry, and green curry with chicken. Several pre-fixe courses are available every day of the week. An intensive option is also available with reduced daily rates for a several-day package. Morning sessions begin at 09:00 and go until 12:20. Afternoon sessions are held 13:40 – 17:00; evening classes are from 18:00 – 21:00. 1,000 THB ($28) for morning and afternoon classes; 900 THB ($25) for an evening class. They’ll even refund you for transportation to the school. You already have a bit of experience cooking. While open to all levels, the instructors at Silom are known to customise sessions for students of all levels. Plus, the price is hard to beat. Located in the international melting pot of Khaosan Road, Maliwan Thai Cooking Class is known for its eclectic menus featuring traditional Thai folk dishes touched with modern fusion and international gastronomy. Maliwan offers some of the greatest variety of classes in Bangkok. With class menu options ranging from “Thai Favourite Dishes” or “Zesty Night Dinner” to “Bright and Tasty” or “Mystique Thai”, there is no palate left unsatisfied. 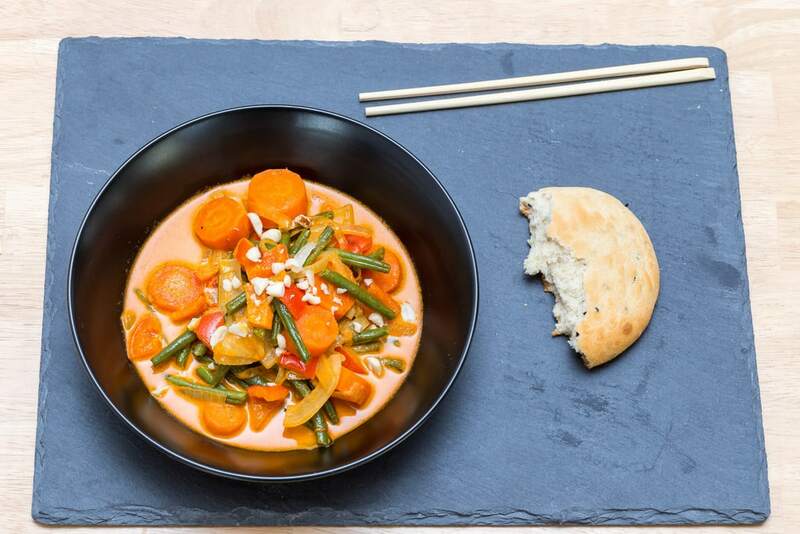 The school even offers a customizable daytime class where students have the flexibility to choose 4 dishes from the cookbook. Morning classes are held from 09:00 – 13:00 and begin with a journey by Tuk-Tuk to the traditional Thai local market. After purchasing the day’s ingredients, students will create four dishes in the kitchen, including the opportunity to make coconut milk from scratch (recipe permitting). The afternoon session is held from 13:30 – 17:30, and is one of the only afternoon classes available that includes a market tour. Maliwan is also one of the only school that offers night classes from 18:00 – 20:30. 1,375 THB ($39) for the morning and afternoon sessions; 1,045 THB ($30) for the evening class and 1,525 ($43.5) THB for the customizable class. You want a class after dark. One of the few schools that offer an evening class, Maliwan is perfect for winding down a day of sightseeing before hitting the bars in the famed Khao San Road area. Situated along the canal system of Thonburi, Amita is undoubtedly one of Bangkok’s most charming cooking schools. Featuring old-world architecture and grounds, it offers an avenue to experience traditional Thai life along the river. The school has an on-site garden packed with produce and ingredients freshly picked for class. Some of the freshly grown spices include guinea pepper, holy basil, kaffir lime, piper sarmentosum, plate brush and Thai basil. Even the most experienced chef has an incredible amount to learn about these traditional local ingredients. The session involves preparation of a four-course meal served at the end of class on the Thai veranda overlooking the canal, shaded by rose apple and mango trees. Tasting samples are provided throughout the class following demonstrations by the instructors. The course cost includes a complimentary pick-up and drop-off service by car for locations in Central Bangkok. The day’s experience can begin even before arriving at the school as you meander through the Old City and board the school’s private boat for a tour of the Chao Phraya River. The boat passes the Royal Grand Palace and Temple of the Dawn before heading into Bangkok Yai canal, along traditional Thai riverside homes. Courses begin at 09:30 and go until 13:30 every day except Wednesday. Three sets are available based on the day, including favourites like wok-fried grounded pork with holy basil, grilled marinated pork with spicy peanut sauce, and coconut pancakes. You want a scenic route to class. Shuttled to the school by car then private boat, you’ll pass some of Bangkok’s greatest riverside landmarks and explore the local canal community. The recipes found at this school are also a bit offbeat compared to the traditional menus offered elsewhere. Need a break from Thai cuisine? Mrs Balbar offers the opportunity to venture away from Thai cuisine, while still celebrating a micro-culture within Bangkok’s vibrant diversity. 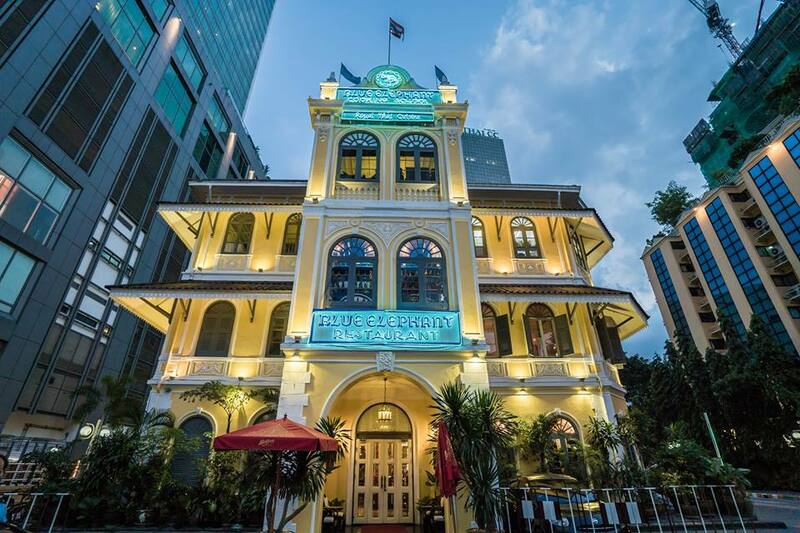 Mrs Balbir’s is a Bangkok staple, open in the Sukhumvit area since 1975. Regularly praised as the best Indian food in Bangkok, it’s hands-down the best place to learn your favourite Indian recipes. The chef’s philosophy revolves around the healing power of food, and its power to bring people together. Mrs Balbir’s offers three classes featuring different menus, with the option of joining one or all three. Students will learn age-old Indian techniques. You’ve already had your fill of Thai cooking classes and want to diversify your growing expertise with some of the region’s best Indian food!